How much is Council proposing to increase municipal taxes? I heard that Ward 2 residents pay way less tax than Ward 1. What is the average tax bill per household in Ward 1 and Ward 2? Average total tax bill per household is actually higher in Ward 2. In 2012, it was $3,193 for Ward 1 and $3,596 for Ward 2. What was the split of costs (levy collected from tax bills) for the two municipalities, prior to amalgamation? What was the trend in the split of levy between the two Wards for the years from 1994 through 2012? For all of those years from 2001 through 2010, did MMAH complain to Council that the area-rated approach being used in any of those years was in contravention of the Act? Did the Act change recently, causing Council to suddenly consider the area-rating approach to be non-compliant? 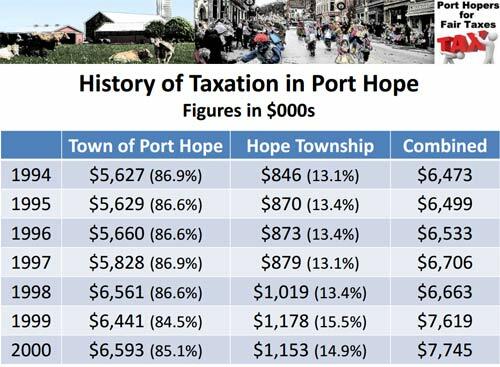 How much municipal tax did the Municipality of Port Hope collect from each Ward in 2013? Ward 1 = $12,311,378 and Ward 2 = $2,325,023. Both numbers are without application of any LLRW interest, and the source is staff’s Option 1 in a report dated October 8th to Budget Committee. How much of the tax burden is proposed to be shifted from Ward 1 to Ward 2, according to the six options that Council was considering in October 2013? $943,700. The source is staff’s Option 1 in a report dated October 8th to Budget Committee, comparing the years 2013 and 2014. What is the total weighted assessment for each Ward? Ward 1 = $1,354,183,986 and Ward 2 = $505,119,788. The source is staff’s Option 1 in a report dated October 8th to Budget Committee, for the tax year 2013. How many households are in each Ward? Ward 1 = 5,091 and Ward 2 = 1,464. The source is StatsCan website, for 2012 data, as noted in Schedule H of the PHFFT Report. On a household basis, what is the average assessment in Ward 1 and Ward 2? Ward 1 = $204,000 and Ward 2 = $298,000 using the assessments that apply to the 2013 tax year. The source is the Port Hopers for Fair Taxes Report, page 5. In those household-average calculations in that report, what property classes are used when adding up the assessments for each Ward? Why is the Agricultural property class included in the household calculations? Many residences in Ward 2 are on properties that consist of the residence, a couple of acres of residential land around the residence, plus a number of acres of agricultural land. In the 1970’s, a lot of farms were subdivided into 10-acre parcels and 25-acre parcels. Under current restrictions against severances within the Oak Ridges Moraine, and against restrictions within areas of prime agricultural viability, these properties cannot be further developed, severed, or subdivided – the “big back yard” comes with the household. What are some of the other property classes, and compared to residential tax rate what is the factor (multiplier) for each? If a residence has some fields around it, does that mean that these properties automatically qualify for the reduced tax rate on agricultural lands? Not automatically. If the agricultural land is farmed directly by the resident (beyond a “hobby farm” level of activity), or if the land is rented to a farm operation that qualifies, and if the resident makes the necessary application to the Ontario Ministry of Agriculture and Food (OMAFRA), then the reduced tax rate would apply. However, if the land is not being farmed, or if it is being “hobby farmed” with minimal production and income, or if the resident does not apply, then the reduced tax rate would be in effect and the agricultural land would be taxed at the full residential rate. What about a property that has a forest – does it automatically qualify for the reduced tax rate related to managed-forest lands? Not automatically – an approved forest management plan would have to be in place in order to qualify those lands for the reduced tax rate. What was the municipal tax rate (mill rate) in 2012? For Ward 2? For Cobourg? For Hamilton Township? Why do some sources claim that Ward 2 has the lowest tax rate in Northumberland? For 2012, LLRW interest of one-half million dollars was used to reduce the levy in Ward 2 and this reduced the tax rate to 0.004233 — that rate ranks as the lowest in the County (with Alnwick-Haldimand just slightly higher at 0.00437184). It’s important to note that Ward 2 is unique within the rural municipalities in the County, because Ward 2 has the $10M LLRW Trust Fund that is to be used to reduce the taxes within the Ward – when comparing tax rates within the County, it is important to base the comparison on rates that are calculated before any LLRW interest has been applied (see 0.005124 for Ward 2, noted in an earlier FAQ). Is each $10M LLRW fund required to be treated the same way in both Wards? No – Ward 2’s $10M was paid into a Trust Fund, for the benefit of Ward 2 ratepayers, to directly reduce taxes. Ward 1’s $10M did not have this restriction. When the licence was granted to proceed with the development of the LLRW facility on Baulch Road, did this licence change the status of the Ward 2 Trust Fund? What did change in regard to the $10M funds, when the licence was granted? The obligations of each municipality (Township of Hope, Town of Port Hope) to the Federal Government were terminated – this means that the Federal Government could no longer require either municipality to return the $10M, because the LLRW project had reached the stage where it was proceeding. Where can I locate specific references to the Ward 2 Low-Level Radioactive Waste (LLRW) Trust Fund? Within the first document, titled “AN AGREEMENT FOR THE CLEANUP AND THE LONG-TERM SAFE MANAGEMENT OF LOW-LEVEL RADIOACTIVE WASTE SITUATE IN THE TOWN OF PORT HOPE , THE TOWNSHIP OF HOPE and THE MUNICIPALITY OF CLARINGTON”, references may be found on pages 50-51, and 54-57. The second document in this set is the final page in the PDF file: Township of Hope By-Law 3605, dated December 19, 2000, BEING A BY-LAW TO AUTHHORIZE THE EXECUTION OF ALL DOCUMENTATION TO APPOINT A TRUSTEE IN ACCORDANCE WITH THE AGREEMENT WITH NATURAL RESOURCES CANADA. 14.2 (1) On January 1, 2001, the reserves and reserve funds of the former Town of Port Hope and former Township of Hope that are dedicated for special purposes become the reserves and reserve funds of the new town but shall be used only for the purpose for which they are dedicated and for the benefit of the ratepayers in the area of the former Town of Port Hope or former Township of Hope to which they are related. For each Ward, what is the cost of Policing? First, we must note that these numbers do not include any capital costs that might be related to a new Police Station in Ward 1. For 2013, the numbers that were presented to the ARCWG are: Ward 1 = $4,024,300 and Ward 2 = $740,400. The share of the total $4,764,700 works out to 84.5% for Ward 1 and 15.5% for Ward 2. Does Council have a long-standing policy to not shift tax burden from one Ward to another? Has any other municipality in Ontario taken an approach that is similar to the one that we are proposing (Option 7)? Yes, City of Hamilton. On January 1, 2001, the new city of Hamilton was formed from the amalgamation of the Regional Municipality of Hamilton-Wentworth and its six municipalities (Ancaster, Dundas, Flamborough, Glanbrook, and Stoney Creek). Hamilton now has both urban and rural components, and uses a similar approach to the one that Port Hopers for Fair Taxes is proposing. How did we find out about City of Hamilton as an example? During an October phone call to MMAH, one of their specialists in municipal taxation suggested that we visit Hamilton’s website and look for area-rating materials that are posted there. What is the status of By-Law 48/2003 (as amended), the by-law that contains the area-rating formula that was used by Council when allocating levy by Ward in the tax rating by-laws for many years after 2003? As of October 31, 2013, By-Law 48/2003 is still on the books, and has not been rescinded. 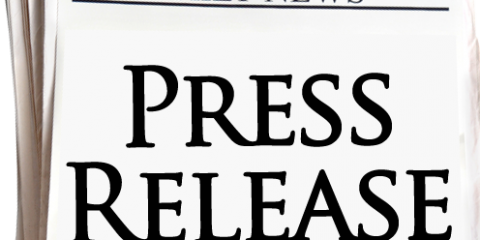 Were the non-Council members of the Area Rating Citizens’ Working Group (ARCWG) “fired”? The citizen members of the committee were appointed by Council resolution in Spring 2012. As of October 31, 2013: (a) the citizen members have not received written communication about their status on the ARCWG from Council; (b) the mandate of the ARCWG as stated in Council’s resolution has not been fulfilled, and (c) Council has not passed a resolution to change the mandate, to remove the citizen members, or to terminate the ARCWG. Given that Ward 1 had only two representatives on the ARCWG and Ward 2 had three, how were the votes distributed? Generally the three Ward 2 votes were considered equal to the two Ward 1 votes. Were the Council reps on the ARCWG also voting members? Does the Municipality issue a regular tax bill to all property owners? What does PIL mean? Government agencies and some special corporations do not receive a regular tax bill like other ratepayers, but these organizations contribute to the tax levy in any case. Examples include Ontario Ministry of Transport, Canada Post Corporation, Ontario Hydro, the Federal Government, railways, and similar organizations. For many years, their payments toward tax levy were called “grants in lieu (of taxes)”, abbreviated “GIL”. More recently, the term “PIL” is being used, as in “payments in lieu (of taxes)”. PIL can be considered to be an adjective, as in the “PIL lands” (i.e., lands owned by these special organizations who make PIL payments), the “PIL assessment” (i.e., the assessed value of PIL lands), and the “PIL payments” representing the money remitted to the Municipality. For clarity, we recommend this type of usage of PIL, instead of a reference to the word “PIL” all on its own, which often raises the question “PIL what?”. How do the PIL lands come into the discussion of area-rated taxes? When the total weighted assessment is tallied for each Ward, the assessed values of all of the lands in the Ward, including the PIL lands, are added into the total. The PIL lands exist within a Ward just like all other properties (listed on the tax roll for each Ward), the PIL lands have an assessed value, and the PIL assessments contribute to the Ward’s total.